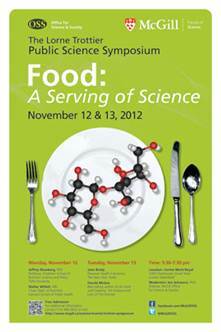 Did you miss this year's Trottier Symposium, Food: A Serving of Science? If so, tune in here and catch both evenings events, with speakers Dr. Walter Willett from Harvard's School of Public Health & Dr. Jeffrey Blumberg Tuft's School of Nutrition, and Jane Brody, NY Times' Personal Health Columnist and Harold McGee, world-class expert on food and cooking. Guarantee it will give you something to "chew" on.